After lots of searching online for treadmill desks and being overwhelmed by the high prices or the horrible quality I used this post as inspiration. In the post she uses an IKEA Fredrik computer work station (small for $119 or large for $149) and a Confidence Power Plus Motorized Electric Treadmill ($249.99 + Free Shipping). 1. Unpack from box (you may have managed this step on your own). 2. Disconnect the wire that runs from the control panel to the motor. It’s best to remove the motor cover and disconnect it there. I tried to disconnect the wire from inside the control panel but it was glued too tight. (Gary: I found the opposite was true, be prepared to try both methods.) You can see in this picture where the wire runs out of the frame and into the motor case. The inside is pretty simple. It’s mostly a motor, circuit board, heat sink, and wires. 3. Remove the control panel from the frame. There are a few screws and it comes off easily. After you’ve removed it from the frame, screw the plastic piece back onto the control panel. It makes it stand up perfectly on your desk. That’s the wire that runs from the control panel to the motor area. 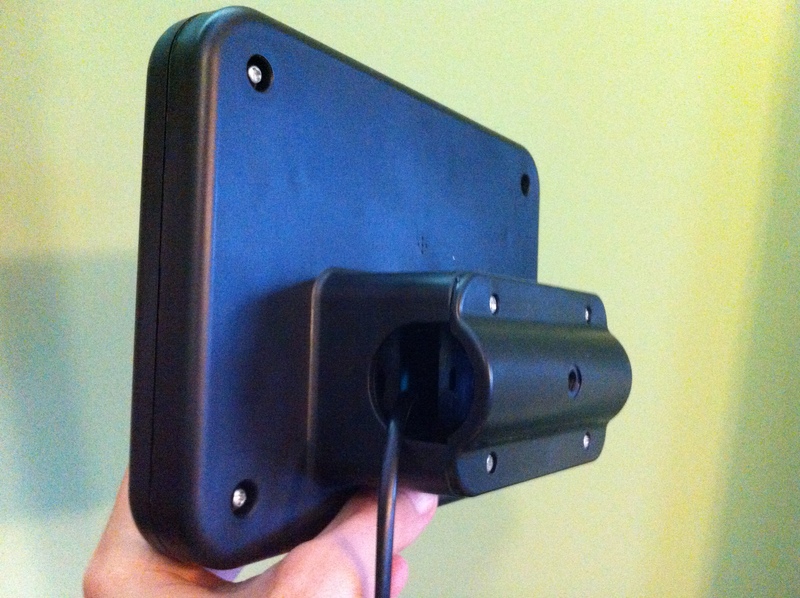 The back of the control panel makes a perfect stand. Red button is start/stop. Plus and minus for speed. 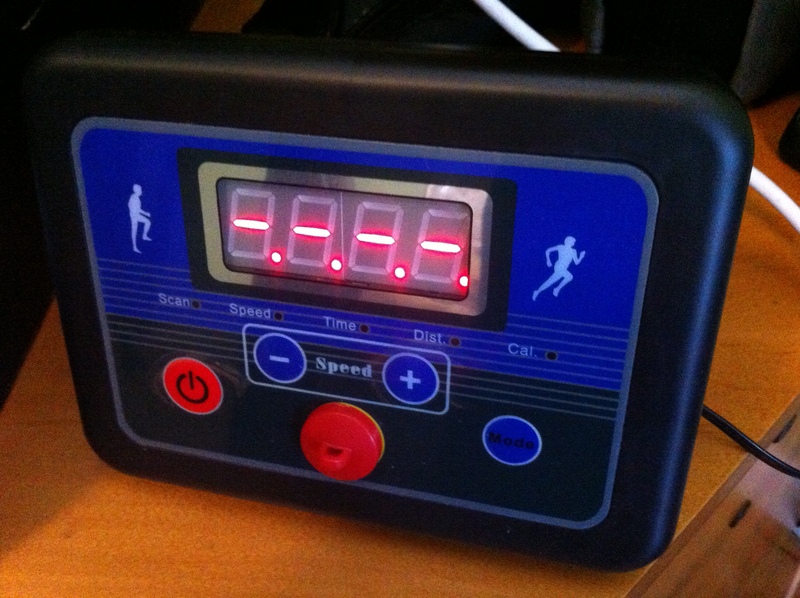 Mode button to switch between distance, speed, time, etc. Red magnetic emergency cut off. It had a string and clip attached but I removed them. 4. You may be able to pull the wire through the frame at this point. I had some trouble so I had to remove the top part of the frame by rolling up the rubbery foam and remove the screws. Then, I could pull the wire attached to the control panel all the way out. I then completely removed the top part of the frame and put it in the closet. This is the top part of the frame. Normally the control panel would be attached in the middle. It’s super light and easy to stand up. 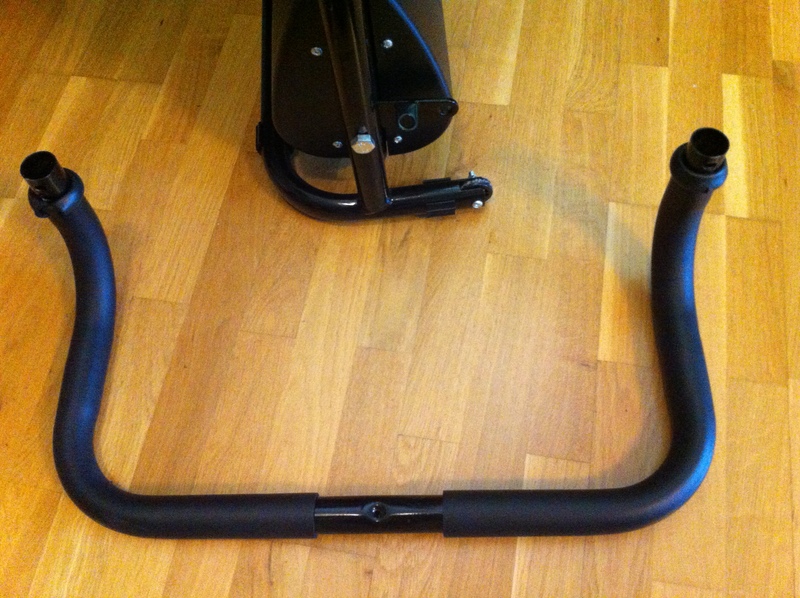 This is a view of the treadmill standing up and where the removed part of the frame would normally attach. 5. You could remove all of the metal frame which the inspiration post did. However, I decided to leave half of it attached. The bottom is just a plastic cover and I figured over time it would crack with the pounding. Leaving part of the frame puts the weight onto some large bolts. One note, I would recommend many people get a mat to go under the treadmill. If you step heavily the frame on the side may touch the floor. If you walk on your mid-foot and not crash onto your heel you’ll probably be fine. I absolutely love having a treadmill desk and recommend it to everyone. It’s been even more pleasant than I had hoped. I definitely feel more alert when walking. I can especially tell during that time of day after lunch when you’re ready for a nap. It takes way less space than I thought. This particular treadmill is perfect for this kind of setup. I haven’t purchased the desk since I wanted to see if I liked it first. I just used an old monitor box and the Stanton Uberstand laptop stand that I use with my turntables to raise the laptop to the right height. I don’t recommend it as a permanant solution since the stand moves around a bit when you’re typing a lot. It’s really just meant to hold the laptop up and have you hit keys every so often. Ultimately, an adjustable height desk would be better so you can look directly at an external monitor and the keyboard/mouse can rest at the proper arm height. I started at 1.4 mph but now go 2.0 mph. It was really easy to adjust to moving and typing at that speed. At 2.0 mph I hit about 10,000 steps after 2 hours according to my Fitbit. It definitely makes me thirsty so I drink more water when walking on the treadmill. It automatically cuts off after 30 minutes. Maybe as a safety thing or maybe for the motor to cool down. At first that annoyed me but now I use it as a reminder to take a break, look away from the screen, and get some water. Hitting the start button kicks it right back on again. I almost fell on my face the first handful of times the treadmill stopped. At 1.4 mph it stops right away. At 2.0 mph it slows slightly before stopping. There is a beeping noise when it stops so now my body automatically stops when I hear the beep. Speaking of beep. It’s so horrifically loud that I put a piece of tape over the internal speaker when I had the control panel open. I need to add additional tape or paper to mask it even more. You just take out the screws from the back of the control panel to pull it apart and get to the speaker. The treadmill goes up to 10 mph so you could run really fast but I don’t recommend it. One false step and you’re off the side of the treadmill and upside-down. It’s nice for walking but not wide enough for fast running. I keep my chair nearby and can easily sit at any time. I probably have gone at most 3-4 hours in a day and alternate between walking, standing, and sitting depending on my mood. The most strange thing I’ve found is that for certain tasks I really want to sit down and think them through. As if the motion is too distracting. After I get over that hump I start walking again. I’ve not been able to pinpoint the exact scenario that causes this. I like to walk backwards when I’m thinking. Trying to operate an iPhone while walking can be problematic. When responding to a text message it often activates the Edit button in the top right or presses other areas of the screen. It’s happened numerous times now so I know I’m not crazy (at least not in this case). I’m guessing it has to do with the static electricity build up. I have to ground myself by holding the laptop and then I can type normally. I was dog sitting and got the dog on the treadmill. He was a bit reluctant at first but he needed to work off some energy. I gently coerced him by holding his leash. He got the hang of it after a while. Cesar approves. People may make fun of you as you bob back and forth on video chats. This post published at 2.0 mph (Gary: 2.1 km/h). I almost fell on my face the first handful of times the treadmill stopped. At 1.4 mph it stops right away. lol – dude, this would have gone viral had you captured it. Hi Gary, I’m really interested in trying this out. 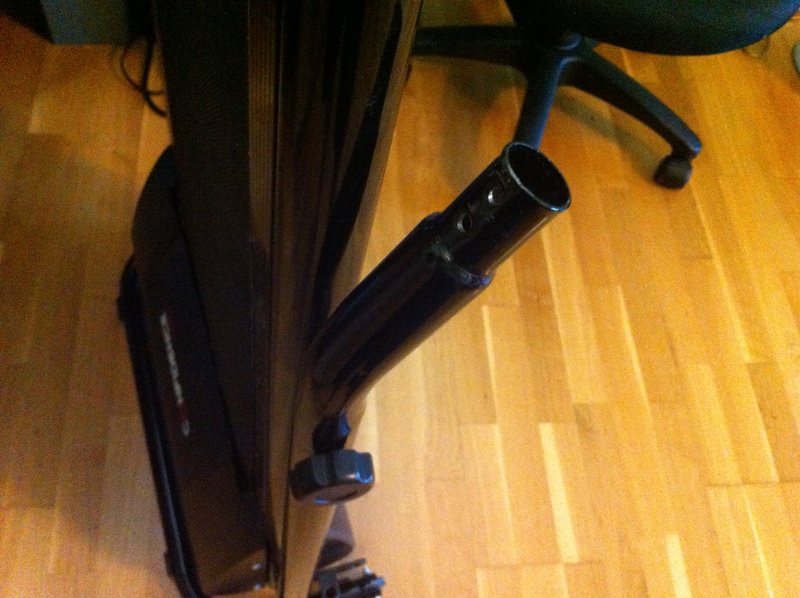 I was wondering, how easy is it to move the treadmill around AND can you still tilt it upward without the stand attached? I’d like to be able to change from walking to easily and I have a small home office. Also, is the treadmill quiet enough at 2-3 MPH so you can do conference calls etc without anyone knowing that you’re walking? It’s fairly easy to move. When I’m not using it, it’s either beside where I’m standing/sitting at my desk, or it stands vertically against the wall if I need the room. Provided you have reasonable mobility, it shouldn’t be a challenge. 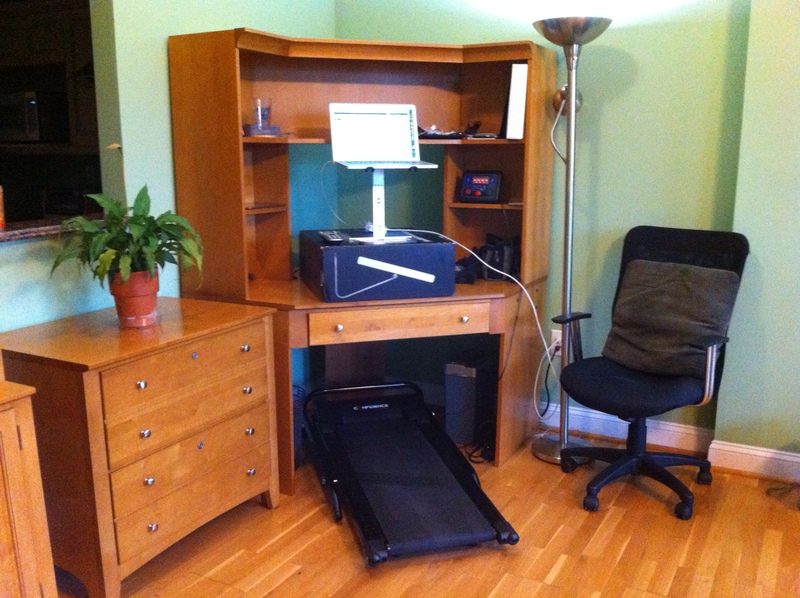 An alternative to moving the treadmill is, (if you have a laptop and a large desk), to move your computer to one part of the desk when you’re walking, and a different part when you’re not walking. 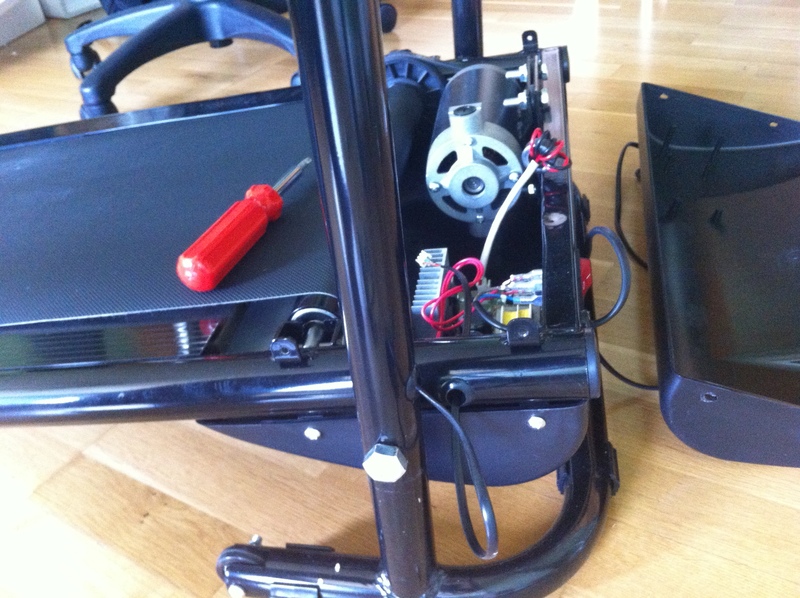 The treadmill I have doesn’t tilt at all – it never had that functionality. If you were after a slight tilt, you could easily put a plank of wood under the front end of the treadmill. This treadmill will probably be audible on conference calls, even at low speeds. I usually stroll at 1-1.5 MPH (I find that higher speeds are too distracting when I need to focus), and even then the whirr of the motor is noticeable. I’m not often in phone calls, so I’ll just pause the treadmill while I’m in the call, then get back to walking when it’s done. Thanks for the response Gary. To clarify, I’m not interested in tilting it while using it; I have limited space and just need to arrange it vertically when not in use. Do you find that the 30 minute time limit is an issue with this treadmill? That seems rather brief to me. Ah, thanks for clarifying. Storing it vertically is not a problem. I quite like the 30 minute limit. It’s a good reminder to take a few minutes away from the computer. If I’m in the middle of something I need to keep working on, it’s no problem to just spend a few minutes wrapping up that thought, then take a break. Cool. I just posted a CL ad to find a handyman to help me with this project. If you’re interested I’ll let you know how it turns out.